In 1946, the Walker opened the Everyday Art Gallery—an educational resource featuring changing exhibitions of well-designed products. Foreshadowing the "good design" movement of the 1950s, it showcased the latest products of modern living, such as the revolutionary fiberglass seating of Charles and Ray Eames or finely crafted Scandinavian ceramics. Although materials and processes continue to evolve, the principles and spirit of the Everyday Art Gallery continue in the Walker Shop. The Walker Shop supports the mission of the Walker Art Center through the sale of merchandise from around the globe. It offers a unique assortment of award-winning contemporary home and office accessories; artisan jewelry; creative toys; and exclusive Walker products, such as the Spoonbridge and Cherry snow dome, "Closed Monday" t-shirt and a poster of Marc's The Large Blue Horses. 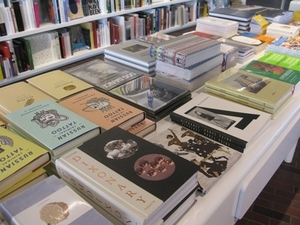 Beginning in 2013, the Walker Shop has collaborated with ARTBOOK to create the richest, most adventurous art book selection in the Midwest. To learn more, and to receive a 25% discount plus free shipping on all books, visit the ARTBOOK @ Walker landing page. All Walker Shop proceeds support the Walker's artistic and educational programs.